2 posts in one day – fantastic! Well, there’s a reason for it. 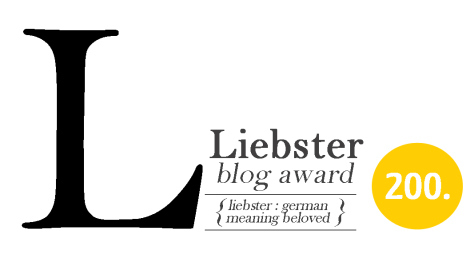 3, yes 3, of my fellow bloggers have nominated me for a Liebster award. Thank you so very much to Cro29 and Organize & Craft for the nods… crazycrochetmama also nominated me and had the nicest words to say (check out her blog to read them)- thank you so much!! I am so in awe that anyone actually reads my blog, let alone being nominated! Check out their blogs by clicking on the blog name. So, what’s the Liebster award you ask? I grabbed that quote from Organize & Craft. You thank the person who nominated you! I’m finding it extremely hard to come up with 11 random facts – oy! What is your favorite place to be? My favorite place in the whole world is Cape Cod. My wife and I go there every year for our anniversary.. and sometimes in between anniversaries. What craft do you love most? My favorite craft, of course is crochet. Where do you see yourself in 5 years time? In five years, my oldest will be in college, my youngest will be in High School. My wife and I are trying for a baby this year, so hopefully my youngest youngest (haha) will be starting Kindergarten. I see myself as I do now. Happy & fulfilled, having everything I need in life… the love of my family. Where do you find your patterns? BOOKS! I collect them, I hoard them, I salivate over them. The pictures, the patterns, the covers, everything. I cannot resist a good crochet book! Even if I never make a thing out of them, I have to have them! Favorite singer/artist? I love Pink, love her. I’m obsessed. Do you dream of making a living out of craft? Absolutely. It’s all I’ve ever wanted to do – to open a local craft store, or pottery place, or anything to do with it. What is the first craft project (outside of school) that you have ever done? Why did you choose to begin blogging? Thank you Di.. and thank you for the nomination. Thank you so much!! I’ll update my blog to include you as we’ll. I love hearing of other gamers, sometimes I feel like the only one. I get a lot of weird looks when I mention it! Thank you so much for the nod and for the kind words on your blog. Thank you so much for nominating me for the Liebster award; it is exciting being nominated for the third time. One of the things I like best about this award is that it brings blogs to my attentions I did not know about. I have really enjoyed reading through your blog, I love the way you turn a phase. We also share the same passion. No matter what other crafts I try Crocheting will always be number one with me also. Rebloging this answer on your blog.